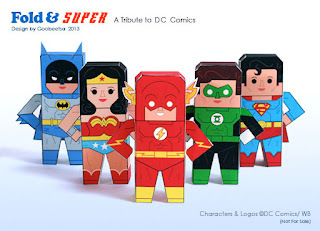 New 52 style "Fold & Super" heroes from goobeetsa. You know you want them sitting on your desk; go ahead and download them. Garen Ewing highlights some old manhua. Not just any old Chinese comics, but it's actually a 17th century porcelain vase featuring art that looks as if it "could have been transferred directly from the pages of a Tintin album." The How to Draw Cartoons group on Facebook has posted scans of Joe Musial's 1937 book Popeye's How to Draw Cartoons. I don't know if this made the rounds whenever it was first posted, but Eliot R. Brown has several pages of candid photos from the Marvel Bullpen crica 1979-1982. My personal favorites are an armed and deadly-looking Marie Severin and Mark Gruenwald paddleballing like a pro. Finally, Kirk Taylor points us to video from Derf BackDerf's presentation "Beyond Fiction: Using Journalism as a basis for Creating Comics and Cartoons" from last Friday in Columbus, Ohio. How Many Comics Do You Own? I Can Haz An Audience? Do We Still Use "LCS"?